So, first things first We have said goodbye to Brage and Tony during this last week of time. To say goodbye to Brage we had a party in which everybody joined. We got permission to drink some alcohol, so it was a great party. I wasn´t drinking myself, given I have a marathon to run the 21st of May and that is soon. But the good thing about Brage leaving is that I have a new roommate now. (I stole Brages hehe). No Greg and I decided to move in together, so there will be some great moments ahead of us. Oh yeah, we have four new students now, we have a Danish couple, Kenneth and Astrid, we have Henry from Tea and biscuit land UK and Ivan from Macedonia. It has been one of those weekends were my legs has not been able to rest at all. Saturday Greg and I went to a city called Huai´an. The trip had a purpose and that was me buying n new puma running shoes, because Huai´an has a Puma store. to those who doesn´t know it, I am addicted to Puma, it is maybe a bit excentric, but I love that brand more than so many other things..
We got up 5.45 in the morning to catch the bus to Xinyi, so we could catch the train to Huai´an. The train ride took around 80 minutes. When we got out the sun was scorching and we started walking, but after 10 minutes in the middle of nowhere, not finding any sign of a inner city, we decided to catch a taxi. We had a not with the address for the Puma store, and we guessed that it would be in some kind of city area. Luckily it was in a mall in the center of the city. home, AND IT WAS. See it is the small things that really gets life better here in China. Tasting a real pizza after 8 months without was simply amazing, it was so good and we only paid 30 kuai for a small pizza. It was our second breakfast so we didn´t go all in on eating, otherwise I would have ordered pasta/lasagna, steak and a bigger pizza hehe. We set of to find the Puma store in the mall, and we found it quite fast, but they only had one pair of running shoes and when I was walking around in them, I didn´t feel they were the shoes for me, so sadly no new running shoes for me. We decided MCDonalds was the next stop. Yeah I don´t eat MCD that much at home, but when you can´t get a burger with beef in it around where you live, then MCD is always a stop worthy. After our meal we wanted to have look around so we set of for the longest walk in our life, or for 15k. turned and then there was a street only with electrical bikes and the next street was hairdressers and shoe shops. We were just talking and suddenly a Chinese woman came up from behind asking us if she could bother us for three minutes. Her name was Trin and she was an English teacher in a school with kids from a very poor background. Luckily she ran into Greg and I because we are very open minded, where others maybe would have thought she tried to get money for her kids or something. The thing is, she offered to show us where they had a supermarket and that got us through another great going with the flow story. We started walking and talking and it she really wanted some of her pupils to meet us, but the school was obviously closed, so she simply called her favorite and best student to meet us. The only reason she wanted her to meet us was so she could practice her English, as an English teacher that is something I always can get behind. The we set of for what suddenly became a tour of the city with a Chinese English teacher and two of her pupils. See that was amazing, cause Trin showed a temple and some of the older parts of the city, which apparently was rare because everything was being modernized. when we finally found the supermarket it was closed, but we had great trip and a we were asked to come back a day to visit the school and see all her kids. we had walked for 15 km, and then we faced the worst of it all, standing tickets for the train home… we are not gonna let that happen again , cause that was a nightmare, and given neither of us really slept and we had been on it for 12 hours, there were not much energy left. Given the great experience we both have decided on coming back when we find the time. This is the thing when you get an opportunity to make a difference for other people you gotta take it, and I am a teacher so for me it is just being a teacher, being me. I always try to make a difference for others, I always try to be better than I am. 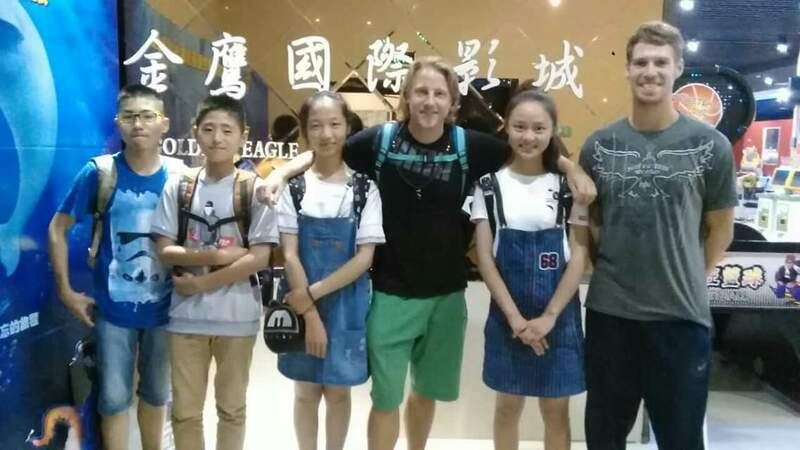 This is another opportunity for me as a teacher, a foreigner a human being to give those kids an unique chance to meet two foreigners and help them train their English language. Today it is Sunday, and We were asked to be ready at nine, so we could perform at Maling mountain. When everybody was ready the heat was already up to 24 degrees. When we came there we walked around a bit before we had to perform. First master Du made us train punches. We had to hit the small branches fast. So everybody stood in a tiny little forest of trees and punched the branches, gathering a huge bunch of people around us. There was a lot of kids, which we found out later had to make a dance performance, and som of those kids spoke some English, so they were able to ask us for pictures etc. Later everybody performed, which maybe wasn´t the best performance in the world. First of all there were no stage, only a narrow road, which didn´t make it easy for the guys. But it was fun, also because we weren´t the only ones who performed and those kids, mainly girls where pretty great. So when I came back from walking the dogs, there were suddenly kids everywhere and in generel chinese people whom I guess hoped to see a laowei, and well there I was with the dogs. I put the dogs back and went as some kind og celebrity and took the pictures they wanted. I love that you can feel as a celebrity when there is people around, and to have the opportunity to walk out when I had the time as a celebrity was awesome hehe. It seems like I just arrived here or something because I remember in the beginning I wrote blogs every week because everything was so new and exciting. The last month or so has been as if I just arrived here, with new things happening every week. Yet again it all started Monday, where everybody was training except me. I took Monday and Tuesday off because I ran a marathon Last Friday, so I needed to relax my body. At lunch master Du came and told us, since it is actually a holiday in China everybody would go to Maling mountain together instead of training. Even though I was off anyway I joined the trip, knowing that we would be walking for several hours. The reason why we took the afternoon off was, because of something called tomb sweeping day. The Chinese have this tomb sweeping day from the 2-5 April. Back in the days those days were about cleaning tombs of the family. I was told that some still take their time to do that now, but most Chinese are just relaxing and enjoying their few days of. The thing is in China they don´t have 6 holiday weeks a year as we have in Denmark, so whenever they finally have some days off they really use them. I always feel very happy when everybody is doing something together, maybe it is because we are less together Monday to Friday because we have different masters. In general, I just like spending time with the family here. It was a good day, but a long walk, I must say Maling Mountain is very beautiful, and they had ice cream so it was amazing hehe. 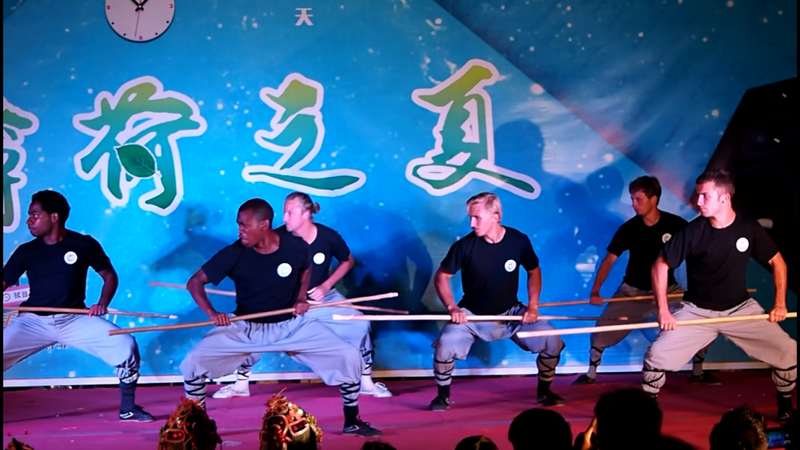 The week flew by, mostly because I didn´t train Tuesday, but on Friday Master Bao came and asked us older students if we were interested to perform some kung fu at a competition. We off course said yes, because the difference between now and last time, was that we knew we said yes to performing not entering a competition. Also master Bao told us there would be a competition in Xuzhou in July. That is amazing to know, because now we can really prepare for that ad think about which forms to enter the competition with. I have snake in my mind, and maybe broadsword, but I really don´t know for sure, because I am starting crane next week and I will learn two more animals before that, if everything goes after my plan. So the Friday afternoon run was cancelled so we could practice our group-form and the form we wanted to perform. Saturday morning Greg, Jauffrey, Thiijs, Brage, Marcel and I took off with master Bao and Mona. It was a long ride in the car and very warm, but we were excited about the performance. When we got there, we were invited to eat at a hotel with some Chinese people, three of them, friends of master Bao and the three others I guess had something to do with the competition. After lunch we walked to the competition and when we arrived, we met two men from America. We always have some fun when we finally meet other laowei´s, mostly because when you live here, you don´t expect to see other foreigners. My deepest fear came true when we saw where we had to perform, because it was on concrete, and I have a breakfall and three jumps to breakfall in my snake form, so I knew it would hurt my hip very much. Funny enough it didn´t, I killed my tailbone while practicing for my performance, given I have a roll in my form and I unfolded to soon, resulting in my tailbone slammed into the concrete. So that hurts today hehe. Nonetheless we had a great time at the performance, and everybody was okay satisfied with their forms and how it went. On the way home we were asked if we wanted to go out to eat or eat in a restaurant, so we chose the restaurant off course. It was the same place we ate for new years and master baos celebration of his new son. we were there already at 4 pm so we had to wait a couple of hours to eat, and we used that time for talking and playing cards. Greg said the thing I have thought a lot lately, because more students choose to stay here for more than a year. Jauffrey is on his second year, Marcel is planning to stay for three years and Shane is thinking about and planning to stay for 5 years. With all the fun we have together in this group and how my stay is coming towards my last four months have made me think a lot about what Greg said out loud: I Just don´t wanna go home, I just wanna stay here. These are actually the thoughts that goes through my mind for the time being, I really don´t wanna leave, I wish I had the time and money to stay for two years maybe more. This is how much I love our Kung fu family in Maling mountain. So we stood there Monday morning discussing when to go out for dinner to say goodbye to Matias, my roommate. We lined up and the biggest bombshell fell on us. Master Du announced that Master Wei were to leave the school to pursuit other interest. Everybody was stunned and I must I was very sad about this. I have had the privilege of having Master Wei train me alone every Tuesday. He was teaching me something called gungfa, which is a mixture of qi gong, tai chi and kung fu. It was developed by a Chinese doctor who made this form for health exercise reasons. The thing that made Master Wei so cool to have around was that he was always so happy, always walked around with the biggest smile on his face and he was very excited in your behave, every time you did something right or improved. I think a lot of people in our family feels very sad about him leaving, especially the students who taught their first kung fu forms from him. He will be missed around here. So Monday night we went to the BBQ place to say goodbye to Matias and master Wei and whilst we were there to welcome our new master to the school, master Wang, last but not least it was also Monas birthday, so a mixture of celebration and goodbyes. A great night it was, which included another Chinese cream cake, my god we have had a lot of those lately. Goodbye Matias, yea he gets a small section for himself, because he was my roommate and he is a Dane like me hehe. He is already missed by all the students here. It wasn´t hard to say goodbye for me, because we will seeeach other a lot when I come back home. This gives me the opportunity to talk about friendship, because Matias and I knew each other before he came here, but we were not friends. These six months has given me a new friend, a close friend which I am very happy about. 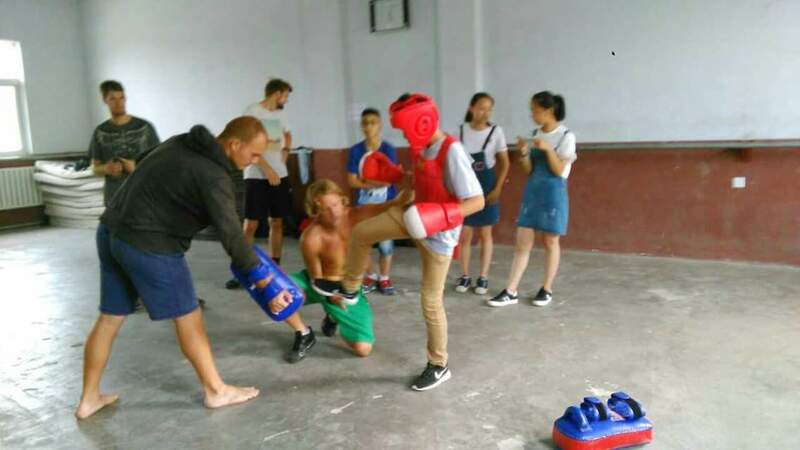 This is also what this kung fu adventure is about and why we are here at the maling mountain academy, to meet new people and gain a lot of friendships, even if it is from your own country. When you live, train and have fun together like we do, you simply become a family, a family you wouldn´t live without. This is also why we train kung fu at maling academy. Another thing that has changed in our family is that our big family now is divided into two groups. One group trained by master Wang and another group by master Du. Team Wang and team Du, I am in team Du, which I like to call the du´ers. I must admit I am not feeling this change, of course training wise you have more time with the master, but socially I think you lose a lot, when you are divided. Some may say: but Morten aren’t you there to train for the most part? Yes I am, but in my point of view I like to be social while training, as a former coach in different sports, I know how much the social life and the fun can make training better. So us divided in two groups doesn´t go well in my mind, because I feel I am missing out one some of the fun happening during training. Mostly because Brage (the master of injuring himself or do stupid, but hilarious stuff during training) is in the other group hehe. When that is being said, there is no doubt in my mind that being divided in two groups is better in the long run, because of the continuously growing number of students in our school. During the night we had a new student coming from Australia, I haven´t had the chance to introduce myself yet so more that later on. My personal training is going well. Friday I ran a marathon as my preparation for the great wall marathon. This was my last test before the wall, and now I only have to maintain my form until the marathon, which means I won’t run more than a half marathon on our stamina-training on Fridays. Other than that I just finished my snake form and will soon begin another animal. My plan is to learn Crane, tiger and eagle, but since master Wei left I have been in doubt about the eagle, because he showed us a competition eagle I really wanted to learn, but we will see what happens. Nonetheless that is my plan for now, and if I have time maybe the five animal form in the end or a small fist form. Next week will be a short training week for me, given I won´t train Monday and Tuesday due to my marathon run Friday. Usually when you run a marathon you should take at least a one-week period with no training, but since I don´t want to lose too much, valuable time in my kung fu training I only take two ekstra days. Wednesday I will be back in training and also I will be back at tai chi training again in which I have had a long break from. It has been one of those great weeks. We started Monday morning where master Bao announced that he had another kid, so therefor we were going out in the evening for dinner and celebration. We went the same place that we were at Christmas. It was a great evening with a lot of food as usual. There is always way more food than we can eat, we consider this a good thing. Us students had a room for ourselves, including Mona and master Wang (pronounced Wong). Which brings me to we have a new master and his name is master Wang. He is about master wei´s age and he is really cool. I am not sure if he is here to stay or it is only for a period of time. I hope he stays, because he is another great addition to our family. who was here for two months. We have gotten another girl here, she is from Germany and is staying for a year, also we have another guy from tea and biscuit-land which means, we now have 4 people from England. But soon we will be joined by a Danish couple so we can equalize it bit again. Even though it was a great week, we have internet problems again. It happens sometimes here and we have learned to live with it, but living without internet is hard for people, because then we need t speak to each other, and in which world is that a good thing? Hehe. Well jokes aside, it gets me to another thing about living in China. Yesterday we talked about how everyone thought we would lay of the rest of the world whilst staying here, and it is a weird thing to think about. For me, it was the plan to at least not have my phone in my hand all the time, because I must admit I am addicted to my phone back home. I don´t think of it as a bad thing because I don´t use my phone and internet that much whilst I am here, so I have dialed it down a bit. I think it all comes down to who you are and what you want to do. I chose this school because it was more modern than other schools and because I still had the possibility of staying in touch with the world. None of us down here, see it as a down side, but you know how addicted you are to the internet when it is down. A small thing as checking the weather we use the internet for, and every time there is something we can´t remember or doesn´t know, google is usually around to help us. Lately the weather has been better and better so we often find ourselves sitting outside talking after training, but this week we found ourselves in the middle of a dance session. 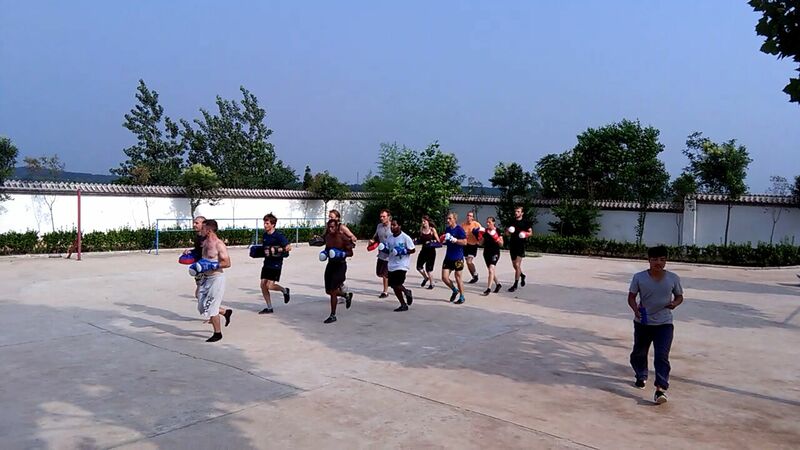 It was Thursday and we had power training, master Wang told us that is was time to relax. You know you are living at a kung fu academy when relaxing means kicking each other in the ribs, the back and the legs. After power training we stood around doing some pull ups and trying to do muscle ups, when we suddenly stood in a circle and people were dancing. It is one of those spontaneous things that never can be replicated again. This gets me to, how cool it is to stay here and how many different people you meet. Right now we have at least three dancers around, but the school also contains everything from party animals to geeks. This time though it is the same people who has a lot of different sides. It is amazing. That same evening, we celebrated Kamal´s birthday with a Chinese cream cake, which are a bit expensive, but something people look forward to. Saturday we went for noodles, Chinizza and to play some pool to celebrate further. Another thing that makes it amazing around here, were when I the other night, night looked down at the training hall and people where learning how to dance. I am currently learning how to play dungeons and dragon, which is a few steps over to my geek limit. 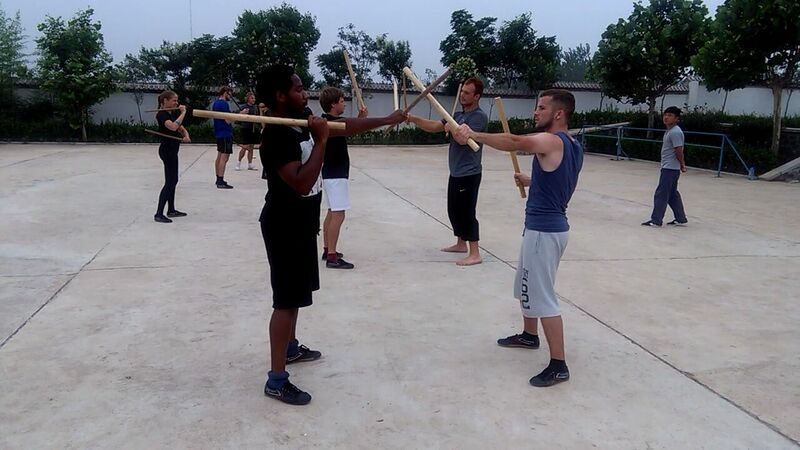 This is why we are here, not only to learn kung fu, but getting new perspectives and trying a lot of new things. I think it is the group of people that makes it possible, people are very outgoing and ready to try new things, and then these amazing things happens. Yesterday a bunch of guys here sad down in a room and just talked and listening to music. This is another cool part, the guys you otherwise sometimes see as crazy has so many side, so when you get in a room with some music, the conversations change from comedy to deep, well and let’s face it, back to comedy again, we can´t have it all hehe . I have found some hills that are very hard to run in which gives me better preparation towards running the marathon on the wall. I am currently hill training every Tuesday and every Friday when we run 10k I run between 20-40k. I have about 50 days until I face one the biggest challenges in my life. I am really happy about my progress and that I can train kung fu and train for the marathon, side by side. So why should you come and traing kung fu in the Maling mountain family? New friends, new perspectives, amazing masters, trying out new things, being part of something bigger, making a difference for yourself and being a part of an international family.